This is fabulous. When you publish a piece on Braille writing machines, let me know so that I can add it some syllabi …. Thank you for such a thoughtful and informative article. As a historian of technology currently researching machines and devices to assist the blind in reading and communicating I found much of interest and references to follow up on. i was particularly impressed by the Bartholomew Stenograph with which I am familiar from the two examples in the Martin Howard Antique Typewriter Collection in Toronto. This is a fine machine but it required the operator to learn the code system and the output could only be read by someone sighted who knew the code. As you pointed out there was tension between the sighted and non-sighted. Where is the Bartholomew machine shown in the photo? It is a beautiful piece of technology. Perhaps the most important typewriter for the blind was the Hall Braille-Writer which was intended to facilitate blind person to blind person communication. I would like to be able to find out more about your research; it sounds fascinating. The site lists the typewriters in the collection along with photos, text and ephemeral material such as ads and correspondence. Thank you Norman for your nice comment. 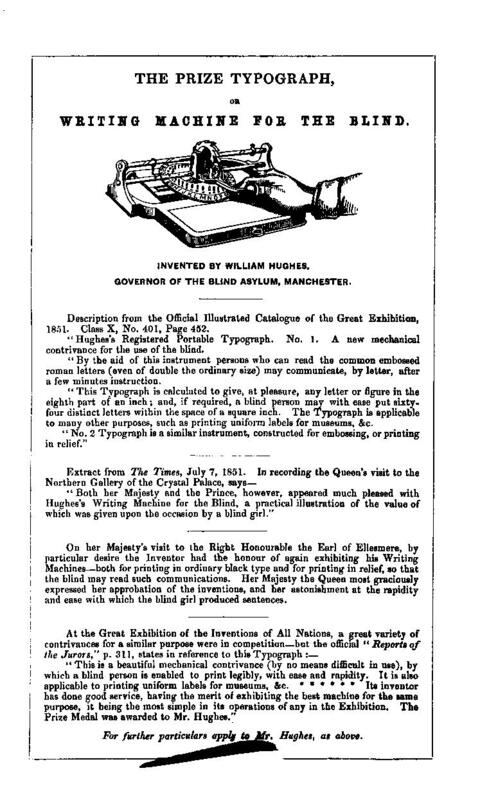 I would love to learn more about your work on early writing technologies for the blind. This is a field that really emphasizes the tension between discourse and tangible things. The conference proceedings of teachers of blind students have plenty of noteworthy references to remarkable machines but the machines themselves are now scattered in museum collections around the world, which of course makes a firsthand study of the objects more difficult. I’ve read many interesting references to and detailed descriptions of the Bartolomew Stenograph but I haven’t had the opportunity to see one myself. The fact that a lot of these precursors to the typewriter took shape in the phenomenological border zone between sight and blindness makes it an intriguing story. Many thanks also for the link to the Martin Howard Antique Typewriter Collection, which was new to me. A visit to that collection sure looks worthwhile. I have enjoyed your article and in seeing Norman’s response. Norman and I have become friends over the past five years. He lives very close tome and we get together and talk typewriters on occasion. I have added a very early Hall Braille – writer to my collection this year which you may find interesting. It is one of the first 100 made and with serial no. 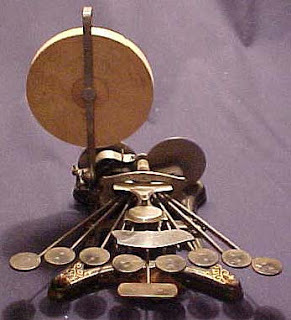 25, the earliest example known of this historic and groundbreaking Braille – writer. Thanks for your comment. Norman told me about your collection of antique typewriters which is really impressive. As I understand it, you restore the typewriters yourself, disassembling them to the smallest elements. You must have a thorough knowledge of typewriting techniques and how they developed in the 19th century, from the nuts and springs to the feel and the sound of different models. I think that typewriters sound beautiful but it’s not a sound you hear anymore in our computerized society and even if you visited a museum that displayed old typewriters, you would probably only get to see them, not hear them. Clicking through your beautiful homepage makes me wonder how the different typewriters sound. Would that be technically possible, to have an audio loop attached to the pictures? It would certainly enhance the tactile sense of the typewriters, a sound that is otherwise only found in old movies today.